Did You Know? 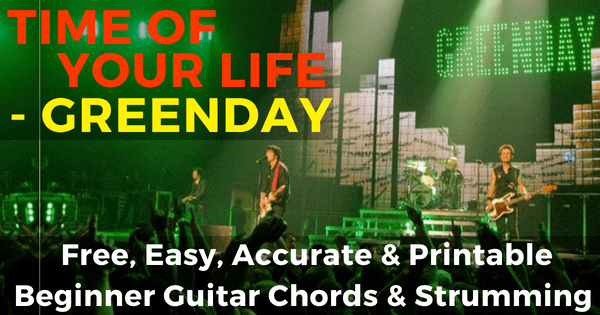 Although the song featured on Green Day’s 5th album release in 1997, Billy Joe Armstrong wrote the song in 1990 but did not feel that it fitted with the band's current material so saved it for later on. (Gx2) Another turning point, a (C)fork stuck in the (D)road. (Gx2) Time grabs you by the wrist, di(C)rects you where to (D)go. (Em) So make the (D)best of this (C)test, and don't ask (G)why. (Em) It's not a (D)question, but a (C)lesson learned in (G)time. It's (Em)something unpre(G)dictable, but (Em)in the end is (G)right. I (Em)hope you had the (D)time of your (G)life. (Gx2) So take the ​photographs, and (C)still frames in your (D)mind. (Gx2) Hang it on a shelf in (C)good health and good (D)time. (Em) Tattoos of (D)memories and (C)dead skin on (G)trial. (Em) For what it's (D)worth, it was (C)worth all the (G)while. (Gx2) Another turning point, a (dC)fork stuck in the (D)road. (Gx2) Time grabs you by the wrist, di(dC)rects you where to (D)go. (Em) So make the (D)best of this (dC)test, and don't ask (G)why. (Em) It's not a (D)question, but a (dC)lesson learned in (G)time. (Gx2) So take the ​photographs, and (dC)still frames in your (D)mind. (Gx2) Hang it on a shelf in (dC)good health and good (D)time. (Em) Tattoos of (D)memories and (dC)dead skin on (G)trial. (Em) For what it's (D)worth, it was (dC)worth all the (G)while.